This coming May, the impossible2Possible (i2P) Youth Ambassador team will team up with world-class adventurers, educators, and scientists to study "Earth Science and the Rise of Dinosaurs" in the great state of Utah! The Youth Ambassadors will be running upwards of a marathon per day across one of the most remote and beautiful regions in the United States of America, with the expedition story unfolding LIVE on the website, bringing the expedition into classrooms and classrooms onto the expedition from around the world! The i2P team will have the have the rare opportunity to visit the interior of The Grand Staircase-Escalante National Monument (GSENM) located in Southern Utah. The monument was dedicated in 1996 and encompasses 1.9 million acres of unparalleled beauty, a geologic history that spans over 270 million years, where over 20 news species of dinosaurs have been discovered in the last decade. It is also home to one of the most complete late Cretaceous fossil records in the world, along with some of the most rugged terrain any i2P Youth Ambassador team has ever attempted. This diverse and contrasting landscape will ensure that this i2P Youth Expedition will be the toughest to date, and will require incredible preparation to guarantee a successful expedition. In their quest to experience this incredible area and communicate their adventure with youth all over the world, the 5 Youth Ambassadors will relay information back to thousands of students in classrooms around the world as they study Earth Science and the Rise of Dinosaurs, share the experience of running ultra marathons day after day, and learn what it takes to execute an international expedition! As globalization and international collaboration increase, there are greater difficulties in cross-cultural communication. Challenges consist of understanding local issues from various perspectives or working with people who have different communication styles. Intercultural communication can help you approach the world with various regional perspectives and give you the tools to build bridges across cultures. As part of their preparation for Expedition Utah, the i2P Youth Ambassadors have undergone cultural sensitivity training to help them gain a better understanding of the social and environmental issues surrounding Utah. These newly developed intercultural skills will enhance their ability to work in teams, become community leaders, and empower others to take action. Team i2P will investigate the topic of Earth Science and the Rise of Dinosaurs. This year i2P has partnered with Simon Fraser University to offer an enhanced educational curriculum to classrooms that wish to learn about geologic history & palaeontology along with our Youth Ambassadors. Our education team will be available in the weeks leading up to, and during, the expedition to guide students and teachers through topical questions, class exercises, and videos on the curriculum, Earth Science and the Rise of Dinosaurs. There will also be opportunity for live videoconferencing with the Youth Ambassadors getting a first hand look at the geologic history and dinosaur specimens! impossible2Possible is once again reaching out to Educate, Inspire, and Empower an entire generation! 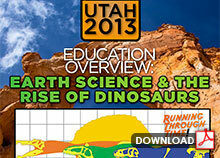 The impossible2Possible Earth Science and the Rise of Dinosaurs Program will be the focus of Expedition Utah. An advanced education resource program will span the preparation and execution of this expedition, with students witnessing what it takes to prepare physically and mentally to push beyond perceived limits. 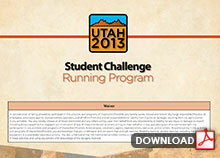 impossible2Possible is honored to have so many incredible schools participating in Expedition Utah! Thousands of students will join Team i2P as we prepare and then run in the interior of The Grand Staircase-Escalante National Monument (GSENM) located in Southern Utah. Check back often to see your school added here!